The Geo Holiday Club at Kingsbury Crossing is located near Stateline, Nevada, just a half a mile from fabulous Lake Tahoe. You will find a huge selection of water sports such as wind surfing, water skiing, boating and fishing, swimming and much more, along with many other recreational opportunities in the Sierra Nevada Mountains. 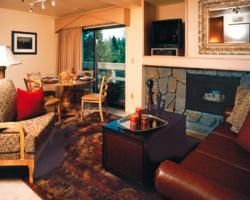 These Lake Tahoe timeshare resales offer you the chance to own your vacation at this exciting and up-scale resort so you and your family can have a first class vacation - summer or winter. The resort offers a Jacuzzi hot tub, sauna and steam room, billiards or pool table, laundry facilities and movie rental. Just a few miles away you will find a driving range, a ski school and championship golf courses. Winter sports are also nearby, including downhill and cross-country skiing and snowboarding, ice-skating and sledding. Surrounded by the beautiful pine forest, your timeshare is conveniently located to all the sights and activities of Stateline, Nevada. There are theme parks, hiking and biking tours, kayaking and canoeing for the daytime, and movie theaters and casinos with live entertainment for the evenings. You can take the Heavenly Valley tram to the top of the mountain and see the spectacular view of the surrounding mountains and lakes. Visitors also enjoy tours on the lake on the Tahoe Queen, an old-fashioned paddle wheeler. Your new vacation home at Geo Holiday Club at Kingsbury Crossing is attractively decorated in alpine ski-lodge décor and may be a one or two-bedroom apartment with a partial or fully equipped kitchen. Each unit has cable TV, a balcony or patio, fireplace and more. 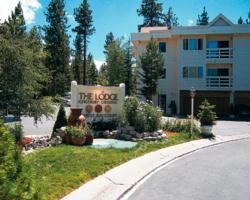 Buying Lake Tahoe timeshare resales at the Geo Holiday Club at Kingsbury Crossing is a great way to secure your future vacations at today’s prices. Not only does it provide you with hassle-free vacation accommodation, you can exchange it for a different location when you want to visit other areas such as the theme parks in Orlando or see the fall colors of New England. Timeshare owners get the benefit of all the resort has to offer including the concierge service to assist you with getting reservations at restaurants or finding activities in the area. Contact Geo Holiday Club at Kingsbury Crossing Specialist Today!